UAE telecom operator Etisalat’s former Nigerian operation, rebranded as 9mobile, will be purchased for $500 million by investment firm Teleology Holdings. An auction was held for the troubled operator, which became a new brand in the Nigerian telecom market in mid-2017 after Etisalat pulled out of the country. The auction for 9mobile was supervised by Barclays Africa, which picked the highest bidder after four companies were shortlisted. Pan-African telecoms group Smile made a bid for $300 million and is said to be the reserve bidder. Nigerian operator Globacom also made a bid for an undisclosed amount, as did Helios Investment Partners. Both Teleology Holdings and Smile have thirty days to prove they have the financial resources to pay for 9mobile. It was reported that Airtel Nigeria pulled out of the auction to purchase the operator because “too many things are hidden about the health of 9mobile”. One area of concern is that two weeks ago, a Lagos high court in Nigeria ordered the board of 9mobile’s parent company, Emerging Markets Telecommunications Service (EMTS), to disband, after a judge claimed it had been established without authority. The court's decision was made after Spectrum Wireless Communication, a company that invested $35 million in EMTS in 2009, claimed the board's approval was not in line with its interests and called for its contributions to the operator to be recognized. Now, United Capital Trustees, which is handling the sale of 9mobile, is appealing the court order. The sale of 9mobile was entrusted to United Capital Trustees after it defaulted on repayments of a $1.2 billion load that was given to it by multiple banks. The Central Bank of Nigeria and the Nigerian Communications Commission (NCC) supported the EMTS board, and had received bids from five parties for the sale of 9mobile. The sale of 9mobile was extended in early January 2018 by the NCC to January 16 after the original closing date passed with no final decision. Reports speculated that the decision would be further delayed after a Spectrum Wireless Communication solicitor said anyone "who transacts business for the purpose of sale or acquisition of EMTS or 9mobile does so at his own risk." 9mobile became a new brand in the Nigerian telecom market in mid-2017 after its previous owner, Etisalat, and an investment fund, defaulted on a $1.2 billion loan. The operator, formerly known as Etisalat Nigeria, was saved by regulators. 9mobile is currently the fourth largest operator in Nigeria. Nigerian telecom operator 9mobile, formerly Etisalat Nigeria, is facing turbulent times. A Lagos high court in Nigeria ordered the board of the operator’s parent company, Emerging Markets Telecommunications Service (EMTS), to disband, after a judge claimed it had been established without authority. The court’s decision was made after Spectrum Wireless Communication, a company that invested $35 million in EMTS in 2009, claimed the board’s approval was not in line with its interests and called for its contributions to the operator to be recognized. Now, United Capital Trustees, which is handling the sale of 9mobile, is appealing the court order. 9mobile became a new brand in the Nigerian telecom market in mid-2017 after its previous owner, UAE telecom company Etisalat, and an investment fund, defaulted on a $1.2 billion loan. The operator, formerly known as Etisalat Nigeria, was saved by regulators. 9mobile is currently the fourth largest operator in Nigeria. Etisalat UAE announced its first VoLTE (Voice over LTE) call over Cat-M1 IoT network in the region setting the future roadmap to deploy advanced networks to meet demands for diversified mobile broadband and communication services for IoT. Etisalat maintains a strong leadership position in IoT technology and solutions with a history of firsts, including the first deployment of a nationwide LTE Cat-M1 network in July this year. This deployment was a revolutionary change and set a benchmark in the IoT ecosystem. A game-changer for the industry, Cat M1 (Category M1) is a new class of LTE chipset that is designed for sensors. They require less power, offer extended battery life, wide coverage, flexible deployment, low latency and support an array of use cases ranging from water meters to asset trackers to consumer electronics. The demonstration was conducted in partnership with Qualcomm Technologies using Etisalat’s IoT and VoLTE capable network infrastructure and IoT devices with Qualcomm MDM9206 global multimode LTE IoT modems. This technology will enable applications across different industries and areas, such as smart homes, industrial monitoring, asset tracking, healthcare, retail, smart cities, wearables, and much more. Cat M1 is important because it extends LTE’s market reach. By allowing LTE to cost effectively support lower data-rate applications, Cat M1 is being touted as a good fit for low-power sensing and monitoring devices such as health and fitness wearables, utility meters, and vending machines, among many others. UAE-based telecommunications provider Etisalat Group collaborated with Huawei and Deloitte to launch a joint white paper titled ‘From Pipelines to Clouds – Etisalat’s Playbook’ that intends to share lessons learned from Etisalat’s road towards becoming a cloud-native telco. The launch of the white paper is part of a collaboration made amongst the three companies for a joint innovation program focused around a playbook on how to implement multiple exponential technologies that constitute a digital transformation journey through a technology perspective. The companies believe that a future Telco Cloud will require different telecom network infrastructure and system architecture to address customers’ digital needs in order to deliver intelligent, quicker, more reliable value added services. “Network transformation should be considered as an opportunity to deploy an experience oriented agile network and operating model rather than an imperative compulsion to address short-term business challenges,” said Peng Xiongji, President Etisalat Key Account at Huawei Technologies. The white paper underlines the vision of Etisalat Group to harness its technological vision and key industry advances to provide innovative premium and differentiated service experiences for customers. 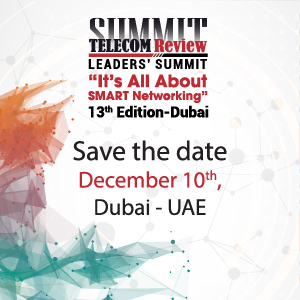 The adaption of new architecture and processes outlined in the paper will enable Etisalat Group to devise a practical road-map for the adaption of SDN and NFV technologies in addition to cutting edge techs such as MEC, AI, Machine Learning, 5G and so on. This will greatly assist Etisalat Group to reassure the path to the envisioned scenario of achieving a cost effective infrastructure which enables Etisalat to launch innovative products coped with future time to market. Etisalat announced the successful completion of the first MENA IPTV (Internet Protocol television) service over an existing WTTx (4G) network trial. The trial is the first of its kind over an existing LTE network, and opens the doors to advanced 5G-era streaming services like IPTV over existing wireless networks. WTTx (4G) provides fast access to home broadband markets over existing LTE networks, enabling operators to quickly launch IPTV services, and greatly improving ROI by finding the right synergy between WTTx and FTTx. Etisalat launched commercial use of WTTx (4G) based wireless broadband internet access and voice services with abundance of 3.5 GHz spectrum last year. The announcement is the start of a new journey as the regional first wireless IPTV and Video-On-Demand (VOD) services, which are based on 4G/LTE customer-premises equipment (CPE) and set top boxes (STBs). Furthermore, this innovative service will pave the way for Etisalat to lead 5G in the world. UAE telecom company Etisalat Group, which operates and owns subsidiaries in Middle East, Africa and Asia, released its consolidated financial statement on October 25 for the three months ending 30 September. Consolidated net profit after Federal Royalty amounted to AED 2.4 billion resulting in a net profit margin of 19 percent and increased year-on-year by 29 percent. The company’s consolidated revenues amounted to AED 12.9 billion. Etisalat Group’s UAE branch saw a 3 percent revenue increase year-on-year amounting to AED 7.6 billion. The UAE branch’s net profit amounted to AED 2.0 billion representing 4 percent increase year-on-year. Etisalat’s UAE subscriber base grew 2 percent year-on-year to reach 12.5 million. The company’s aggregate subscriber base reached 140 million up slightly from 139 million in Q2. In Q3 2017, Etisalat signed a strategic partnership as part of Dubai Future Accelerators program to bring future medical care solutions to UAE and the MENA region. The company successfully completed the fastest 5G live trial globally reaching 71Gbps, and launched 4G services in Egypt through its subsidiary Etisalat Misr. Etisalat also launched a new brand ‘Swyp’ targeting youth in UAE. Satellite operator Intelsat and Etisalat have announced plans to expand the distribution of Intelsat EpicNG services in the Middle East. Under a multiyear expansion, Etisalat will upgrade its network to deliver higher performance to customers in the region using the Intelsat 33e high-throughput satellite. Concurrently, Intelsat will leverage Etisalat’s teleport in Dubai as an expansion node of the IntelsatOne Flex service. The teleport acts as an extension to Etisalat’s Smart Hub services. Equipped with the latest technologies and platforms, it serves as one of the globe’s major satellite hubs, hosting more than 40 antennas. This will expand options in the region to benefit from Intelsat EpicNG high-throughput services. Intelsat EpicNG, according to Intelsat, is a high performance, next generation satellite platform that delivers global high-throughput technology without sacrificing user control of service elements and hardware. Egypt’s Minister of Communications and Information Technology, H.E. Eng. Yasser El Kady, told Reuters on Sept. 11, that Egypt will launch commercial 4G services by the end of September. The Minister also said the government will release additional frequencies to operators in the future without committing to a timeline. The launch of commercial services will draw a line under a messy 4G auction process in Egypt. The first operators to sign deals with Egypt's regulator to acquire 4G licenses in October 2016 were Vodafone Egypt, Etisalat and Orange Egypt. Meanwhile, the nation's state-owned Telecom Egypt also plans to launch 4G within a year of receiving its frequency license. Obtaining the licenses wasn't a straight forward process for the operators, with Vodafone Egypt, Etisalat and Orange Egypt at first rejecting the terms of the auction because they felt there wasn't enough sufficient spectrum on offer. The telcos also disputed conditions which required 50 percent of the total license cost to be paid in US dollars. The spectrum sales were delayed due to the telecom operators refusing to participate until the issue was sorted out. Orange Egypt, for example, came to an agreement with Egypt's regulator to pay half the license fee in US dollars. Introducing 4G to Egypt has been part of the government's long-term plan to reform the telecom industry and raise more money for the state. After the spectrum auction, Minister El Kady said $1.1 billion had been raised, and an additional $1.13 billion for the state budget. Etisalat is launching a new youth-targeted SIM in the UAE called Swyp in an apparent effort to compete with the launch of the Virgin Mobile brand by du’s parent company EITC. The Swyp prepaid mobile service hasn’t officially launched yet, but the brand’s website is up and running and the apps have been uploaded to the app stores. In an interesting twist, the Swyp service will only be available for customers aged between 15 and 29 at the time of subscribing and must present a valid Emirates ID card for proof of age. It seems Abu Dhabi-based Etisalat is eager to attract millennial mobile users who might be tempted to join Virgin Mobile UAE due to its flexible payment structure. Etisalat’s Swyp service offers 5GB of social data for AED 50 per month and users can purchase add-on packages such as 500MB of data for AED 25, 1GB of data for AED 50, 2GB of data for AED 100, 4GB of data for AED 150, and 1GB Instagram and Snapchat package for AED 12. So far the service has been advertized on social media sites that attract youth such as Instagram, Facebook and Snapchat. Swyp SIMs will be delivered directly to millennials who sign up, or they can be purchased from one of Etisalat’s stores at Dubai Mall, Downtown, Burj Dubai, Mall of the Emirates, Burjuman, City Centre Deira, Festival, City Mall, Ibn Battuta and Mercato Shopping Mall. Virgin Mobile UAE SIMs can also be delivered directly to customers after purchase “within an hour”, according to Product Manager Juraj Cangar. Virgin Mobile UAE is unique in the sense that it doesn't require customers to visit a physical store. Everything to do with your mobile plan is done through the app that was built by the Virgin Mobile UAE team. To join, you can simply download the app, register your details, and then choose your monthly plan. Vodafone UK also recently launched a youth-focused service called VOXI, a mobile offering for people aged 25 and under, that enables them to “use their phones the way they want to,” the company said. The VOXI SIM, available from 8 September, lets users indulge in selected social and chat apps (Facebook, Messenger, Instagram, WhatsApp, Pinterest, Snapchat, Twitter and Viber) as much as they like, without affecting their data allowance. Similarly, Etisalat’s Swyp offering targets data over voice calls to attract youth who live their lives through social media. The Swyp SIM card charges 0.6 fils per second for local voice calls, 18 fils per local SMS, 60 fils per international SMS, 45 fils per local MMS of 50KB, and AED 1.80 for international MMS of 50KB. Virgin Mobile, Vodacom and Bua Group are among companies potentially interested in buying 9mobile, formerly Etisalat Nigeria, according to a report by ThisDay. 9mobile recently rebranded after the UAE’s Etisalat terminated its management agreement with its Nigerian unit, giving up its 45 percent stake to a trustee. Etisalat pulled out of Nigeria after its firm couldn’t come to an agreement with its lenders to restructure its $1.2 billion debt after it missed payments. Following Etisalat’s exit, the Nigerian firm announced it had rebranded as 9mobile and said it is open to discussions with new investors. According to the report, Virgin Mobile, Vodacom and Bua Group, a local diversified business with a stake in various sectors, all plan to submit their memoranda of interest and technical presentations to a consortium of banks which have appointed advisers to evaluate acquisition bids. Virgin Mobile is said to be willing to absorb the balance of the $1.2 billion debt 9mobile owes to 13 financial institutions, and stands out as the likely winner. Virgin’s chances are also high because of Vodacom’s rivalry with South Africa’s MTN over the years, therefore several former MTN Nigeria executives are backing Virgin’s potential bid. If Virgin successfully takes control of 9mobile, it will reportedly execute a development strategy in which every cell site will be upgraded to 3G or 4G. The move could be extremely beneficial for a nation that has mostly 2G cell sites. 9mobile has about a 13 percent share of Nigeria’s mobile market, according to GSMA Intelligence, behind MTN, Glo Mobile and Airtel.